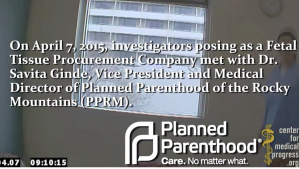 A Planned Parenthood executive plots harvesting of “intact” fetuses that are considered born-alive infants under federal law – and warns “they’re probably going to get caught” if they try it in anti-abortion states, a new undercover video by the Center for Medical Progress shows. Actors posed as representatives from a human biologics company in the video. They meet with Dr. Savita Ginde, Planned Parenthood of the Rocky Mountains’ Vice President and Medical Director. The meeting took place at the Denver abortion-clinic headquarters. For 2nd trimester procedures, Planned Parenthood does not use feticide or digoxin. This means that intact deliveries can possibly be born-alive infants according to 1 USC 8 of federal law.